The Hunt for the Haunting in "Beirut Photographer"
Photojournalist George Azar left the U.S. in 1981 and headed towards his estranged homeland, Lebanon. In 1982, it had become a warzone. Lebanon, with its Palestinian refugees, had conflicted with Israel - resulting in absolute bloodshed in what is now known as the Lebanon War. With a camera in hand, he documented the conflict, covering stories and mailing back photographs to newspapers in the United States. Azar returns to Lebanon thirty years later to revisit the faces that haunt him in his photographs. In "Beirut Photographer", we join him on the quest to find them. The documentary was directed by both Azar and his wife, Mariam Shahin for Al-Jazeera's Witness Programme ("bringing world issues into focus with courageous and inspiring human stories"). This past Thursday, the couple graced The American University of Beirut's West Bathish auditorium, presenting their production to students, faculty and visitors alike. The screening was organized by Outlook (AUB's weekly student publication) and the Media Studies program at AUB in an effort to bring to aspiring journalists examples of commendable, real-world experience. The documentary screening was followed by a Q&A with the photographer and subject of the film. The co-director also took questions from the curious. I attended the screening because I'm a documentary fanatic. Regardless of topic, I enjoy seeing such productions from a creative vantage point. In comparison to films, documentaries don't just present stories - they have to provide real-world information. How that's done is the real feat (how does one tell a life story without coming off as superflous?). Azar and Shahin's production have really set the bar high for future regional documentaries (which are few, but forthcoming). Needless to say, I didn't look at the documentary from a political point whatsoever. I enjoyed the documentary largely because it was very well-produced. The narrator of the film is also its subject; Azar's voice is an excellent complement to the film. Though the subject material was tense and dramatic, his narration was sincere and very kind. His soft-spoken narration, I believe, is what brought tears to the eyes of many members of the audience. The directors also included images of young Azar himself. We see the good-looking photographer juxtapositioned against his older self. Inclusion of these images push towards intimacy with the viewers, bringing a face to the mysterious name and voice. A weakness of the documentary might be the reactions of the characters. The purpose of the documentary is to show Azar's journey back to Lebanon; showing the characters in his photographs prints of their younger selves decades earlier calls for a melodramatic response which I was looking forward to. But - when presented with photographs of their younger selves, the characters' reactions were mild, if not somewhat insincere. I was hoping to see their initial reactions. What does it feel like to be approached, thirty years later, with a photograph of yourself alongside your comrades in a state of war, ones that may or may not be deceased? Photographs you probably had no idea even existed, but that somehow travelled over oceans throughout years and have come to find you. Of course, I'm guessing production logistics require an OK from the characters before photographing them with a towering video camera, and on that basis reactions are unlikely to be too dramatic. Certainly takes away from the magic. Still, the documentary is a must-see for all. Whether you're a photographer, a journalist, a Lebanese, a Palestinian, a cinematographer, whatever - "Beirut Photographer" pleases. You can stream "Beirut Photographer" at no cost on the Al Jazeera website - where you can also read Mariam Shahin's excellent "Filmmakers View". 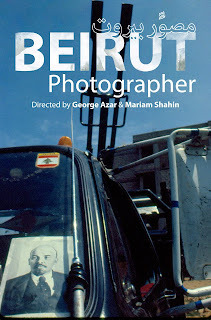 See the Beirut Photographer Facebook Page for exclusive photographs and screening information.